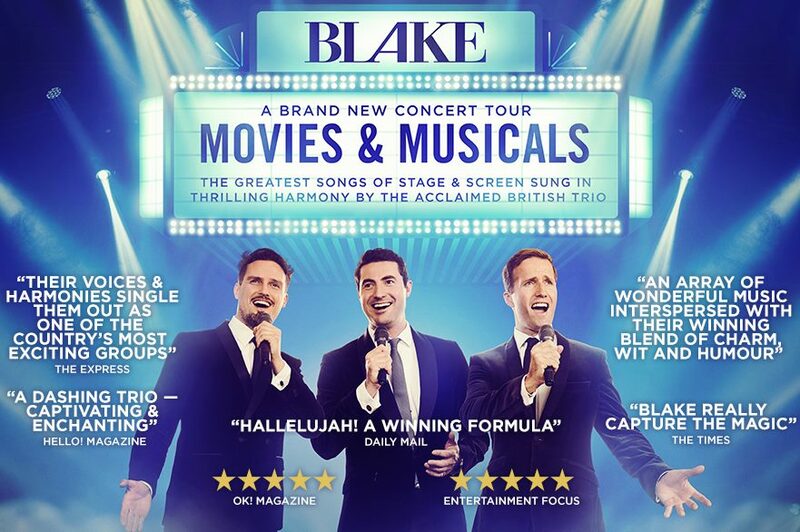 Blake - Movies and Musicals The Brand New Tour! See Blake perform all your favourites hits in this brand new tour. To book call 0844 871 7651* or online *BKG FEES APPLY. CALLS COST UP TO 7P PER MINUTE, PLUS YOUR PHONE COMPANY’S ACCESS CHARGE. Blake - Movies and Musicals The Brand New Tour! See Blake perform all your favourites hits in this brand new tour. To book online 0844 871 3024* *BKG FEES APPLY. CALLS COST UP TO 7P PER MINUTE, PLUS YOUR PHONE COMPANY’S ACCESS CHARGE. Blake - Movies and Musicals The Brand New Tour! See Blake perform all your favourites hits in this brand new tour. To book call 0844 871 7607* or online *BKG FEES APPLY. CALLS COST UP TO 7P PER MINUTE, PLUS YOUR PHONE COMPANY’S ACCESS CHARGE. Blake - Movies and Musicals The Brand New Tour! See Blake perform all your favourites hits in this brand new tour. To book call 0844 871 7650* or online online *BKG FEES APPLY. CALLS COST UP TO 7P PER MINUTE, PLUS YOUR PHONE COMPANY’S ACCESS CHARGE. Blake perform for the very first time in Hungary. All your favourite Blake hits in this amazing setting. Blake perform for the very first time in Hungary at the Budapest Arena. See Blake live in this beautiful setting at Malmesbury Abbey and help raise money for Dorothy House who provide end of life care for people in the Wiltshire area. For tickets email ticketsforblake@gmail.com. BLAKE - THE ANNIVERSARY TOUR. Celebrating 10 Years of Singing Together. Blake: Songs of Stage & Screen. On sale soon. Blake are delighted to announce they are playing at the Last Night of the Blickling Promos 2016. Saturday 13th August 2106 - more details to follow. Blake will be playing live with special guest star Dame Shirley Bassey. This is sure to be an unforgettable performance. Book early to avoid disappointment. Christmas classics with Blake. Blake present their long-awaited debut Christmas show, featuring festive songs in beautiful trio harmony. On sale soon. Blake In Harmony. Tickets on sale soon. Call 01553764864. Three Englishmen in New York. See Blake perform live at New York's finest cabaret club on the very same night as Woody Allen. BLAKE – Live in Concert – The 2013 UK Tour To book call 01670 367228. BLAKE – Live in Concert – The 2013 UK Tour. To book call 01707 645005 or online . BLAKE – Live in Concert – The 2013 UK Tour. To book call 01926 334418. Love Lifts Us Up Tour. Love Lift Us Up Tour. Part of Blake's Chinese tour. Blake's first major tour of China. Love Lifts Us Up Tour. To book call 01394 282126. See Blake live in the Philippines. Blake are back in the Philippines. Three dates in the Philippines. To book call the box office on Tel: 01603 218323 or visit the Cathedral shop. Tickets start at £10. An Evening With Blake - 2011 UK Tour. Call 01522 561644/561600 or book online. An Evening With Blake' UK Tour 2011. Tickets available in person from Malvern Theatres Box Office, Grange Road, Malvern, Worcestershire WR14 3HB or by phone on 01684 892277 and online. An Evening With Blake' UK Tour 2011. One of three special Christmas shows with Thomas Spencer Wortley. The last date sees Thomas return home to Derbyshire to perform at Derbyshire County Cricket Club, in aid of the Queen's Hospital Scanner Appeal. Box Office - 01332 388101 (tickets sold through Derbyshire County Cricket Club) or online. One of three special Christmas shows with Thomas Spencer Wortley performing in the beautiful Royal Hall, Harrogate, in aid of the Royal Hall Restoration Trust. Ticket available at the Box Office - 0845 130 8840 or online. One of three special Christmas shows with Thomas Spencer Wortley performing in the historic Old Royal Naval College Chapel in the heart of Greenwich, in aid of the charity PiggyBankKids. Box Office - 01332 388101 (tickets sold through Derbyshire County Cricket Club) or online. Blake will be performing on day one of this three day classical music festival held at The Shedmore Estate in Kimmeridge. Blake join Faryl Smith, Darius, Russell Watson & Escala for a summer extravaganza! Headlining performance. First night sold out, second date added! Performing alongside Rihanna and Lady Gaga. Performing live from the NEC in Birmingham broadcasted on Sky Sports TV. Interview and performance live on Aled Jones' Sunday BBC 2 Radio Show. Interview and performance live on GMTV Morning Show.